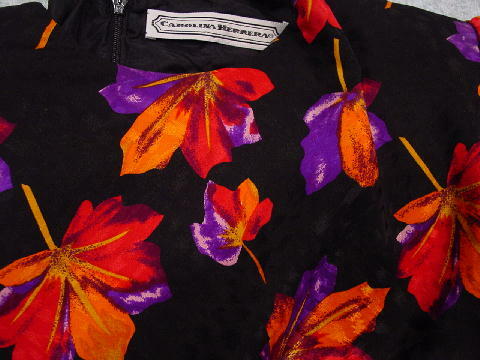 This 100% silk dress has a black background with bright red, orange, maize, pastel pink, and royal purple flowers. It's lined in black silk too. The back zipper is 24" long. It has a jewel (round) neckline and gathering by the shoulders, which have pads. It has a tone-on-tone pattern. The long sleeves have 4" zippers by the wrists. The back of the bodice goes to a rounded V and there is gathering below that, giving the skirt some movement in the back. The front is styled like a shift. This is a beautifully made dress inside as well as outside. It's a very striking looking dress. A model wore this to a premiere and to several New York shows during fashion week. It's good for holidays or that special event, and perfect for going somewhere fancy, such as anniversary celebrations, special romantic nights, or formal night on a cruise without having to wear a full length dress. shoulder to end of sleeve 24"